This week Alejandro was asked to step up from his usual role as trainer into the competitive riding position after Michelle Parker took a nasty fall on the very first day of the Blenheim Oaks June Classic show. With an entire week of showing ahead, Alejandro took over the reins of Xel Ha, Reina, and Tocayo (pictured here with Alejandro). Fortunately Alejandro has trained and and known these horses for quite awhile. He actually was present at Reina’s birth and was up for her first time under saddle. Now competing in the 1.3m division with a future in the Grand Prix arena, Reina is quite a success story for Rancho Las Tres Cruces. Alejandro also got to pick up the reins of the feisty 6 year old mare Xel Ha who was discovered by Alejandro and Salvador as a 4 year old in Mexico City. Xel Ha has an incredible future ahead of her as an international level jumper. 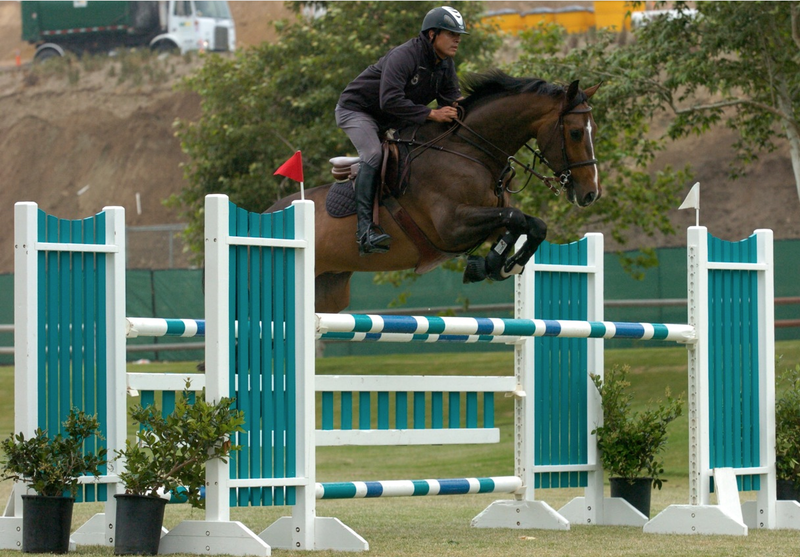 Alejandro is shown here competing aboard the Mexican export Tocayo who was also discovered by the Alvarado brothers. He placed well in the Open Jumper class on this young superstar.